Primary percutaneous coronary intervention (PCI) has become treatment of choice for ST-elevation myocardial infarction (STEMI) in England. The assumption in most trials, and in their translation into clinical practice, is that centralisation of primary PCI for STEMI into large facilities is inevitable and essential. We feel that a successful and preferable primary PCI service can be delivered in a medium-sized district general hospital (DGH). We performed a retrospective analysis of the first 18 months of primary PCI for STEMI in our unit. We compared our results with standards set out in the National Infarct Angioplasty Project report. Our median call-to-balloon time was 95 minutes and median door-to-balloon time was 50 minutes. Door-to-balloon times were shorter during working hours than out of hours, and were shorter for patients taken directly to the catheterisation laboratory than those admitted via A&E. During the period of assessment, 14% of patients experienced a major adverse cardiovascular and cerebrovascular event (MACCE). The overall mortality rate was 6.7%. No patients were transferred to our surgical centre for emergency treatment. We believe our data demonstrate that a system utilising regional Heart Attack Centres is not essential for satisfactory clinical outcomes, and may not be the preferred choice for patients and their ongoing post-myocardial infarction care. Expansion of PCI services in well-organised DGHs may be an equally good solution. Increased travel time/distance for patients associated with lack of infrastructure, and, thus, delay. Exclusion of some patients for a variety of reasons (age, frailty, comorbidity, diagnostic uncertainty, acute severe haemodynamic instability, etc.). Concern that activity is below the minimum for safety and effectiveness to be assured. Inadequate facilities and staff numbers to maintain the service cost-effectively. Coronary angioplasty has been available at Basingstoke and North Hampshire Foundation Trust (BNHFT), a medium-sized DGH without on-site cardiac surgery, for seven years. When it began this was an unusual service model, and there were questions about safety, effectiveness and sustainability of the service. However, over this period there have been satisfactory clinical outcomes and the service has been uninterrupted with no emergency transfers for surgery. Only a handful of cases have been referred for PCI in other centres. PPCI has been available from the beginning of the service, but only since 2 January 2009 has it been available 24 hours per day, seven days per week. Equitable access has developed during this period in other facilities for populations to the north, east and south of the normal catchment population, and while there has been some increase in the referral footprint of the service to the west, the experience is substantially that of a sole comprehensive DGH provider to a defined and stable population. This experience is, therefore, well placed to answer questions about safety, effectiveness and sustainability in real life, and to examine whether there are advantages or disadvantages to this model of care, against the prevailing strategy of centralisation into Heart Attack Centres. Comprehensive access regardless of comorbidity and acute instability. Early access for patients with and without a pre-hospital diagnosis. Better integration of the STEMI episode into more long-term cardiac and non-cardiac primary and secondary care. Superior patient experience as a result of local rather than remote care. We report the first 18 months of the service with regard to safety, effectiveness and sustainability, and provide information about its contribution to realising these possible advantages. BNHFT is a medium-sized DGH providing secondary care cardiac services to a population of approximately 300,000 people. The population is part rural, part urban with a young but rising age profile. The standardised mortality ratio (SMR) for coronary heart disease is 1.0. PPCI takes place in a dedicated cardiac catheterisation laboratory that is available 24 hours per day, seven days per week. This is adjacent to the eight-bedded coronary care unit. A non-dedicated angiography suite, located within the radiology department, is occasionally used for cardiac work. The elective and non-elective invasive cardiac programme is integrated, running five days per week, with out-of-hours on-call for non-elective work; the service is never suspended. The cardiac catheterisation laboratory is staffed with nurses, cardiac physiologists and dedicated radiographers in and out of hours; there is no residential on-call team. 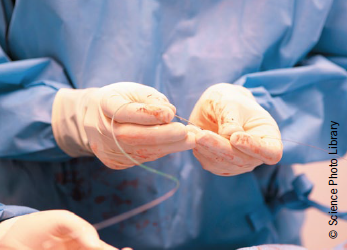 Our facility performs >500 elective or urgent PCI procedures per year. Pre-hospital diagnosis by paramedics with pre-alert through telemedicine and direct admission to the catheterisation laboratory. Presentation to Accident & Emergency department (A&E) and direct transfer to the catheterisation laboratory. Diagnosis as current inpatients with direct transfer to the catheterisation laboratory. There are no set exclusion criteria and a senior cardiologist is always available for triage and discussion. Diagnosis of STEMI is by standard electrocardiogram (ECG) criteria (including [presumed] new left bundle branch block) and clinical features.18 Diagnostic coronary angiography is the default care pathway in uncertain cases. Individual patient care records are kept in standard hospital notes, and all PPCI activity is also recorded in a dedicated cardiac database (DataCam™), for internal use and submission to national databases (Central Cardiac Audit Database [CCAD] and Myocardial Infarction National Audit Project [MINAP]). Patients in this report were identified from our in-house cardiac database (DataCam™). Individual patient details were retrieved from the cardiac database and individual hospital records, and follow-up information was cross-checked with patients’ general practitioners. Standard definitions for call-to-balloon times, door-to-balloon times, and major adverse cardiovascular and cerebrovascular events (MACCE) were used. For patients who self-presented to A&E, their time of arrival was taken as first medical contact (and call) time. Out of hours is defined as outside the hours 0800–1800 Monday to Friday, and all bank holidays. BNHFT benefits from having a dedicated team of cardiac rehabilitation nurses who identify and offer to enrol all STEMI patients into our nationally recognised cardiac rehabilitation programme. Data between the dates 02/01/2009 and 21/08/2010 were available for analysis. A total of 165 PPCI procedures for STEMI were performed in 163 patients (male=135, female=28) during this time. There were 29 ‘false activations’ of the service; patients who underwent emergency angiography, had no evidence of acute coronary occlusion, and, therefore, no PCI was performed. Nine of these procedures were undertaken out of hours. All procedures were carried out via a transfemoral approach. Glycoprotein IIb/IIIa inhibitor was used in 30% of cases. Two of these patients (both male) underwent a second procedure during the same admission for STEMI due to stent thrombosis (ST) and are included in the analyses (one acute and one sub-acute). One patient (male) went on to have inpatient coronary artery bypass grafting (CABG) in view of severe complex coronary artery disease (not following a complication of the PPCI procedure). A total of 152 patients (male=126, female=26) were treated with PPCI and stenting, while 11 patients (male=9, female=2) underwent balloon angioplasty only. Of these 11 patients, four had presented with late ST, one had acute ST, one had sub-acute ST, one had an embolic coronary artery occlusion, which resolved with antithrombotic medication, in two patients the vessel was heavily calcified and felt to be not amenable to stenting, one case had in-stent re-stenosis (ISR) treated with a drug-eluting balloon, and, in the final patient, the occlusion was in a distal small calibre vessel felt to be unsuitable for stenting. Overall median call-to-balloon (CTB) time was 95 minutes (range 11–645), while overall median door-to-balloon (DTB) time was 50 minutes (range 8–578). Median first medical contact-to-balloon time (FTB) was 84 minutes (range 11–632). For patients admitted via A&E, median DTB was 58 minutes (range 8–578), while for those with direct admission to the catheter lab median DTB time was 35 minutes (range 11–459). DTB times were shorter during working hours than out of hours, and were shorter for patients taken directly to the catheterisation laboratory than those admitted via A&E. Interestingly, both CTB and DTB times were longer in women than men (figure 1). The percentages of patients in whom PPCI reperfusion was achieved within the recommended CTB and DTB time points are shown in table 1. For 11 patients ultimately treated with PPCI, there was diagnostic uncertainty due to the initial ECG being determined as non-diagnostic for STEMI leading to a delay in DTB times. An additional five patients, who presented after suffering an out-of-hospital cardiac arrest, were admitted and stabilised in the A&E department following successful resuscitation before a decision to proceed to coronary angiography with or without PPCI was taken. In these cases, the time to delivery of PPCI was longer than for the straightforward STEMI presentations. Our finding of longer CTB and DTB times in females compared with males has been reported previously. We are not able to ascertain the cause for this, or whether this gender-related delay affects outcome from our data. In our data, 37 of 165 (22%) patients treated with PPCI were aged 75 years or older (75–93 years), while 19 patients (12%) were aged 80 years or older. Of those aged 75 years and above, 26 patients (70%) presented via the A&E, 15 of which presented outside of office hours. In our subgroup of patients aged 75 years or older, the median DTB time was 68 minutes (range 18–578) while the median CTB time was 150 minutes (range 90–656). In 160 of the cases, single-vessel PPCI was undertaken to the infarct-related artery (IRA) only. In the majority of cases of multi-vessel disease, the culprit IRA was treated and significant stenoses in non-IRAs were electively addressed four to six weeks later. However, in five cases, critical stenoses were identified in a non-IRA that were felt by the operator to be clinically important and were treated by PCI during the index PPCI procedure. The mean number of stents implanted was 1.2 (range 0–3, median 1), while mean number of drug-eluting stents (DES) used was 0.5 (range 0–3, median 0). Two patients with left main stem occlusion received DES. Mean length of stay (LOS) for the total population was 3.2 days (range 1–29, median 2 days). For men, the mean LOS was 3.3 days (range 1–29, median 2 days), and for women, mean LOS was 2.7 days (range 1–23, median 2 days). During the observational period, 23 (14%) patients experienced a MACCE (including death). There were four cases of definite stent thrombosis (one acute, one sub-acute and two late) and one case of possible late stent thrombosis. One patient suffered an ischaemic stroke and three patients experienced a transient ischaemic attack. Two patients had significant gastrointestinal bleeds requiring hospital admission. There were two cases of in-stent re-stenosis presenting as recurrent angina. Over the course of the study period, 11 patients (male=8, female=3) died, giving an overall mortality rate of 6.7%. Nine of these patients died during the index hospital admission equating to a 30-day mortality rate of 5.5%. The other two patients died within six months. In England, it has been suggested that a ‘hub-and-spoke’ system be developed to provide PPCI for STEMI, whereby in each region there would be a specialised Heart Attack Centre (often the Cardiology/Cardiothoracic surgical referral centre) that would provide all PPCI. Although this system has been shown to be clinically effective in Europe and North America,9-12 this has not been replicated in any English studies to date. While it may seem reasonable that the same outcomes would be achieved in England, this should be proven by randomised-controlled trial, given that our geography, road networks and infrastructure differ. We believe that a ‘hub-and-spoke’ system is not necessary, and that safe and effective PPCI can be delivered in a secondary care hospital (with off-site surgical cover that is performing a medium-to-high number of PCI procedures per year). We present the findings from the first 18 months of PPCI for STEMI from one such facility, Basingstoke & North Hampshire Hospital. In our facility, PPCI was delivered within the recommended DTB time for 82% of our patients, with a median DTB time of 50 minutes. However, the proportion of patients receiving PPCI within a CTB time of <120 minutes was less good, especially out of hours and in the elderly, which we feel reflects patient delays in presentation, poor pre-hospital diagnosis, and inefficient transport to hospital. The pre-hospital delays occur despite the attending paramedic team making a diagnosis of STEMI in many cases and utilisation of a telephonic transfer system for ECGs to be relayed from the ambulance to our cardiac care unit to improve pre-hospital diagnosis for STEMI. A total of 115 (70%) of our patients came via our A&E department, where the diagnosis of STEMI was formalised and the PPCI team alerted. This figure is higher than we would like, given that admission via A&E leads to prolonged CTB and DTB times. This may reflect a need for either improved education of paramedic services, including increased awareness of the availability of direct catheter lab admission, or improvement of the logistics of patient admission, or both. Our 30-day and overall mortality rates of 5.5% and 6.7%, respectively are similar to those published by NIAP (5.6% at 30 days, 8.7% at one year, and 9.9% at 18 months13) and no patients had to be transferred to our surgical centre for emergency CABG or salvage PCI. Our data show that we are able to provide an effective and safe PPCI service. In our facility, a consultant cardiologist is available 24 hours per day for individual case discussion, and, if required, to clinically assess such patients. We feel such decisions would be more difficult for interventional operators based in regional Heart Attack Centres, who are reliant on accurate assessment by staff reviewing a patient with possible STEMI at a distant location. A process that, at best, undoubtedly introduces a time delay and at worst could lead to either inappropriate admission to regional centres for unsuitable patients, or non-transfer of potentially suitable (albeit higher risk) patients who may then receive suboptimal treatment. Similar issues exist for patients who are successfully resuscitated following an out-of-hospital cardiac arrest. In these patients, it is not always immediately clear that the cause of the cardiac arrest is STEMI, and such patients often require a period of stabilisation and assessment in hospital prior to consideration for PPCI. We believe that, while PPCI services at Heart Attack Centres are likely to be very good, these centres may be located at significant distances from the patient’s home and family, making visiting financially onerous and time-consuming. In addition, it needs to be determined whether the regional Heart Attack Centre has the capacity to cope with all STEMI for PPCI in a designated region. The average length of stay after PPCI for STEMI in our data was three days. It is not clear from the ‘hub-and-spoke’ proposal whether STEMI patients would remain in the Heart Attack Centre until time of discharge or be transferred back to the local DGH immediately after PPCI (depending on clinical stability). If the latter, how would the local DGHs feel about this design, given they were not providing the treatment in the first instance? Further, this also raises the issue of payment for PPCI; it is likely that payment be made to the regional Heart Attack Centre from the Health Authority relating to the patient’s locality. Would the payers feel comfortable that care was being provided in the most cost-effective way, as the care providers are likely to be employed within a different Health Authority. Many of these issues would be avoided in a system utilising appropriate local DGHs for PPCI. As we provide our own PPCI service we can comprehensively enrol all STEMI patients into our cardiac rehabilitation programme to ensure good recovery and optimal ongoing care. There is a concern that, in a ‘hub-and-spoke’ system, some patients from our catchment area may receive PPCI and post-myocardial infarction (MI) management in the Heart Attack Centre but then, following discharge, not be readily identified to us, and, therefore, miss their rehabilitation and follow-up. The BNHFT PPCI programme detailed in this paper was delivered by a dedicated team who operated a 24-hour-per-day, seven-day-per-week, on-call rota system: 87 (53%) of the PPCI procedures performed in this study were undertaken out of hours, which impacts on the daily responsibilities of all the specialties represented in the PPCI team, as well as having a financial impact for the hospital in the form of out-of-hours payment to staff. However, these out-of-hours payments would need to be compared with the costs involved in the transfer of patients to and from regional Heart Attack Centres, added to the tariff charge in such centres for the PPCI procedure, should a regional model be established. We would hope that our data would reassure the DoH that PPCI for STEMI can be delivered safely and effectively in a DGH, and, therefore, the strategy of Heart Attack Centres may not be required. Rather, service expansion within existing DGHs with PPCI facilities could be considered to ensure sustainability. In conclusion, we present data from the first 18 months of 24/7 PPCI for STEMI at a medium-sized, high-volume PCI DGH in England, illustrating that a good service can be provided in a dedicated secondary care facility. We believe that these data demonstrate that a ‘hub-and-spoke’ system utilising regional Heart Attack Centres is not essential for satisfactory clinical outcomes, and may not be the preferred choice for patients and their longer-term post-MI care. Expansion of PCI services in well-organised DGHs may be an equally good solution. This research received no specific grant from any funding agency in the public, commercial or not-for-profit sectors. The authors declare: no support from any organisation for the submitted work; no financial relationships with any organisations that might have an interest in the submitted work in the previous three years; no other relationships or activities that could appear to have influenced the submitted work.